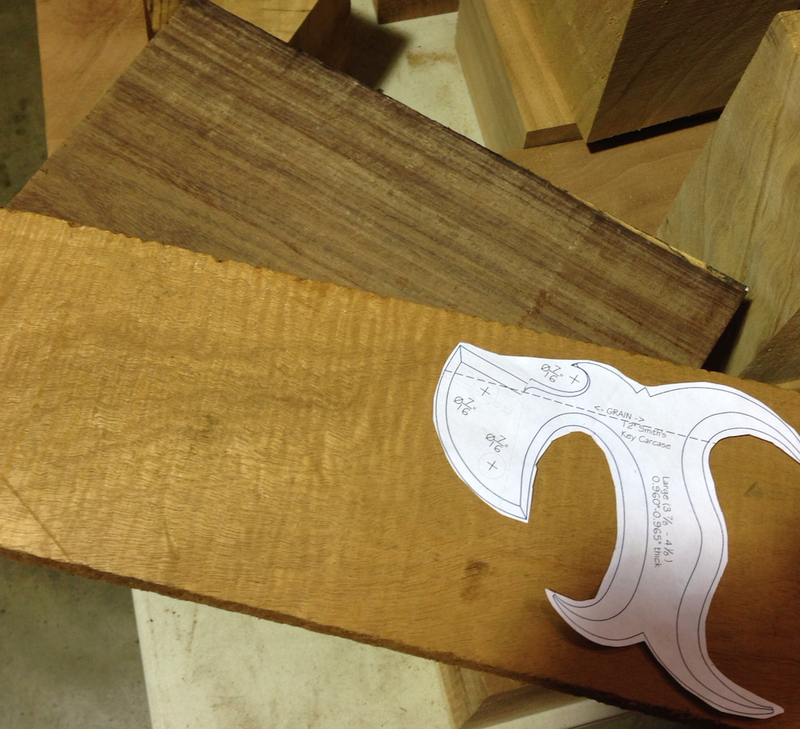 I had a little time after work yesterday and decided to rough out a second handle for the backsaw project. I made the first one in some dark Claro Walnut, but I was concerned that I would screw it up when cutting the slot or doing the final shaping of contours. So I decided to cary a spare along through the process. This one is also Claro, but it’s a marbled color with an interesting spray of figure. I slabbed it out of a turning block I picked out of a sale bin years ago, I can only get one handle as there is a crack in the block. It’s too bad because this one has some great color. On the second handle I used the scroll saw to profile it after drilling the holes. This worked a bit better than the bandsaw cuts as there was less waste to clean up. Both methods work fine, but I like having to do less rasp work to get the the lines on the pattern. 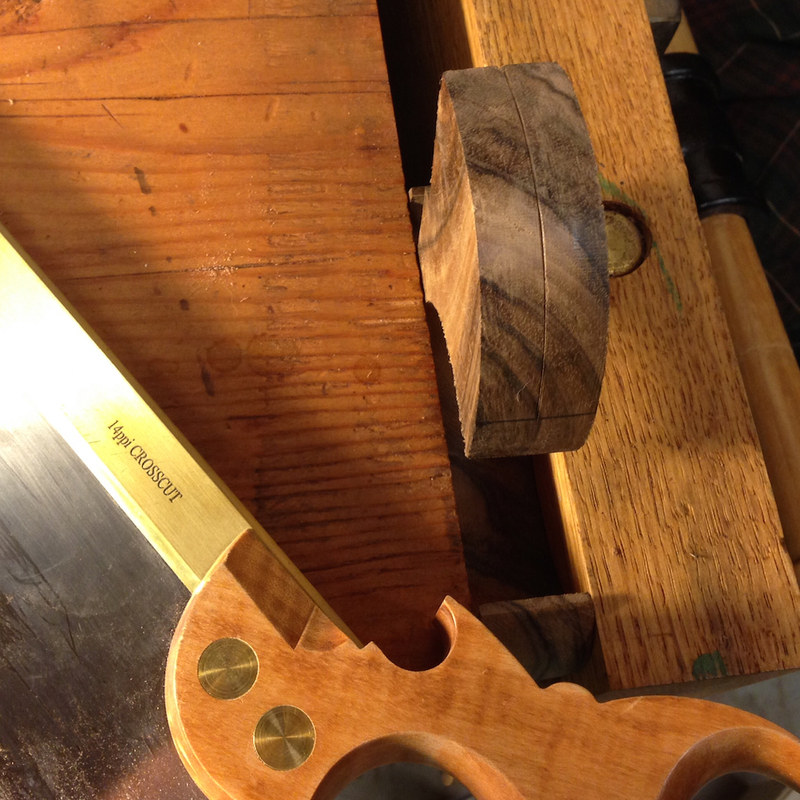 From here, the next step is the scary slotting of the handle for the saw plate. It actually turned out not to be a big deal, maybe the saw gods were watching over me. I used a marking gauge to scribe a centerline where I wanted to cut, then used another saw to start the key all the way around to a depth of about 1/8″. Then I worked the kerf deeper and before I knew it I was watching to see that I hit the stop marks for depth. Getting ready to saw the first handle slot. On the first handle I used my 14ppt crosscut saw, I know this is a rip cut but I was concerned that the narrow very my dovetail saw leaves would be too thin for the saw plate. I didn’t saw quite as perfectly as I’d like, there are a couple of spots where the teeth gouged the side of the keep making the opening look slightly uneven. But it’s centered and straight and functional. For the second blanks I used my trusty dovetail saw. 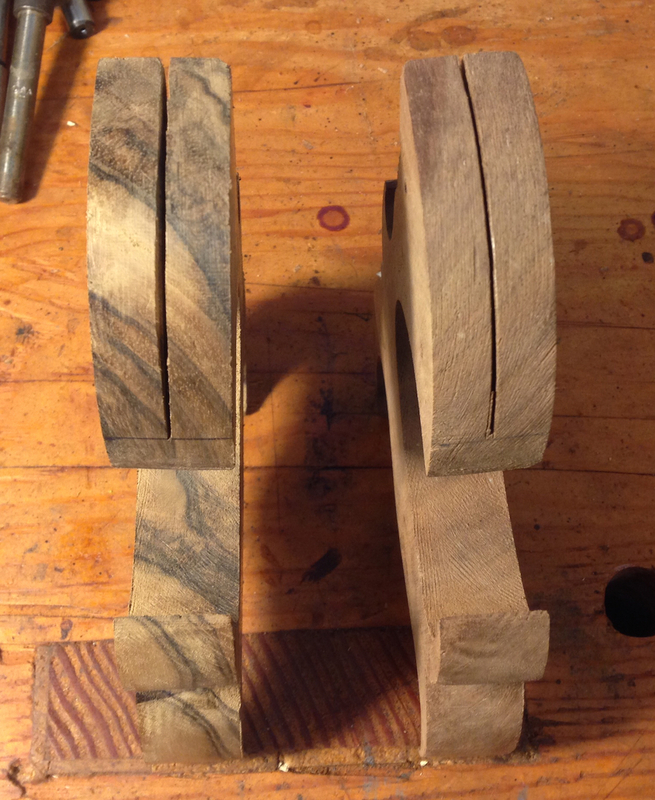 I cut a nice crisp slot with no tear out…that was too tight for the saw plate. So I re-sawed the kerf with the crosscut saw and that opened it up just enough to fit the saw back. Both handles slotted. The one on the left is a little sloppy, but I think it will look fine when it’s all shaped and assembled. Once I get some coffee I’ll head out to the shop and do the next step — which is to fit the saw plate and back to the handle. The saw plate need to be clipped to set against the back of the slot, and I need to layout and cut the mortise for the bronze back. With that done I’ll be able to fit the fasteners, and do the final shaping on the handle. This should go relatively quickly, although I’m already wishing I hadn’t said that out loud. Saw plate test fit into handle. The plate needs to be clipped at an angle so it can settle completely against the slot in the handle. Just in case something goes amiss and neither of these handles work out, I picked up a couple of scraps of wood at Global Wood Source in Santa Clara. These will also be useful “just in case” everything goes well and I decide I need to build a bunch more saws to fill the gaps in my saw till. One is tiger stripe figured Honduran Mahogany, the other is Granadilo. The Granadilo is a South American wood that is used as a tone wood in guitars. It’s heavy, and the coloring looks like East Indian Rosewood to me. Extra handle material. Just in case. Blackburn Tools offers saw handle templates for the kits they sell, these are slick because they are all available is different hand sizes. Isaac also has scans of actual handles for a number of vintage saws. Wenzloff and Sons have several patterns available on their site. They used to sell kits and parts, but they have reduced their line and I’m not sure how active they are in saw making these days. Two Guys In A Garage, which is a great and unpretentious name, have a nice selection of patterns for many different vintage saws, including one for the Disston saw in my Millers Falls miter box. Hmmm… They also have parts for building saws including folded backs. Tools for Working Wood sells a nice looking dovetail saw kit, their instruction packet includes a pattern for the handle and tips of cutting the slot and mortising for the saw back. Thanks for the CrafstmanSpace link. It kept me out of the shop for 2 hours while I checked out all the goodies it has. Yeah, that’s a neat resource right? I found it while looking for ideas for marquetry patterns, Paul (shipwright) on LJ is doing an amazing marquetry jewelry box that uses a pattern from this site as the basis for the drawers. I like the marbled handle; it’s different in a good way. I’ve been somewhat tempted to try this but I’ll live vicariously through you until I do.